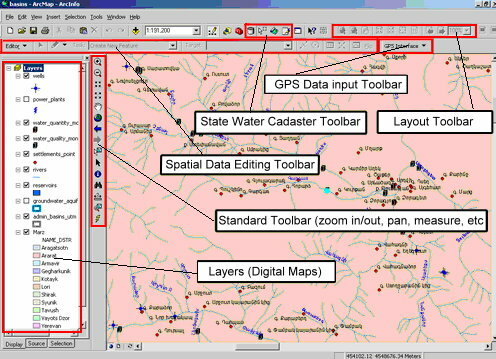 GIS for State Water Cadastre has been developed by Geocom, ltd for the Water Resources Management Agency of Ministry of Environmental Protection in 2005 and has been updated in 2006, 2007, 2008, 2009 and 2010. The GIS is based on ESRI ArcGIS 9.x environment with customized applications developed in Visual Basic for Applications and Visual Basic 6.0. GIS consists of digital maps (wells, power plants, water quantity monitoring stations, water quality monitoring stations, settlements, rivers, groundwater aquifiers, river basin management areas, river basins and marz boundaries); external database residing in MS Access; GIS interface, based on ESRI ArcGIS 8.2 environment; 16 input forms developed in VB 6.0 and connected to GIS. Input into Access tables can be done either through GIS, or externally through input dialogue boxes.